We believe in the idea of community and connecting those with shared values. You may find the individuals, organizations, and institutions noted in the first list to be of interest. ¶ The second list features books that highlight trends and possibilities relating to humanity’s future — and in the process explain much about the social, cultural, political, and economic changes that are occurring globally. In Doughnut Economics, Oxford academic Kate Raworth lays out the seven deadly mistakes of economics and offers a radical re-envisioning of the system that has brought us to the point of ruin. Moving beyond the myths of ‘rational economic man’ and unlimited growth, Doughnut Economics zeroes in on the sweet spot: a system that meets all our needs without exhausting the planet. The demands of the 21st century require a new shape of economics. If you think the world is coming to an end, think again: people are living longer, healthier, freer, and happier lives, and while our problems are formidable, the solutions lie in the Enlightenment ideal; the conviction that reason and science can enhance human flourishing. With intellectual depth and literary flair, Pinker makes the case for reason, science, and humanism: the ideals we need to confront our problems and continue our progress. Factfulness: The stress-reducing habit of only carrying opinions for which you have strong supporting facts. Our problem is that we don’t know what we don’t know, and even our guesses are informed by unconscious and predictable biases. It turns out that the world, for all its imperfections, is in a much better state than we might think. An urgent and essential book that will change the way you see the world and empower you to respond to the crises and opportunities of the future. Harari examines what might happen to the world when old myths are coupled with new godlike technologies, such as artificial intelligence and genetic engineering. Future-casting typically assumes that tomorrow will look much like today – we will possess amazing new technologies, but old humanist values like liberty and equality will still guide us. Homo Deus dismantles these assumptions and opens our eyes to a vast range of alternative possibilities, with challenging and thought-provoking arguments on every page. An exhilarating, thought-provoking anthology that explores how a compassionate approach to business, politics and the environment can transform our planet. By placing the concept ‘that we should do unto others what we would have done unto us’ at the heart of how we make decisions and live our lives, this book shows how diverse fields and disciplines can come together around a unifying theme, and provide a foundation for a different planetary narrative and purpose. All leaders are constrained by geography. Their choices are limited by mountains, rivers, seas and concrete. To understand world events you need to understand people, ideas and movements — but if you don’t know geography, you’ll never have the full picture. 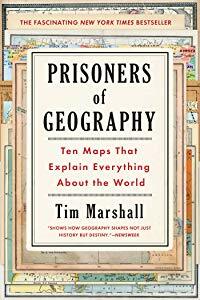 Prisoners of Geography looks at the past, present and future to offer an essential guide to one of the major determining factors in world history. Sapiens takes us on a breath-taking ride through our entire human history, from its evolutionary roots to the age of capitalism and genetic engineering, to uncover why we are the way we are. Taking both the macro and the micro view, Sapiens conveys not only what happened and why, but also how it felt for individuals. The book invites us to not only connect past developments with present concerns, but moreover to question our basic narratives of the world. The book’s conclusions are enlightening and provocative. 21 Lessons builds on the ideas explored in Harari’s previous two books, Homo Deus and Sapiens, to take the pulse of our current global climate. It untangles political, technological, social and existential questions, and highlights how they impact the everyday lives of humans worldwide. By presenting complex contemporary challenges clearly and accessibly, the book invites the reader to consider values, meaning and personal engagement in a world full of noise and uncertainty.